Magnesite (MgCo3) is used to produce magnesia refractories, also known as Refractory Magnesite Bricks. Magnesia fired at 16000°C is known as DBM or Dead Burned Magnesite which is essential in Production of magnesia based Refractory. 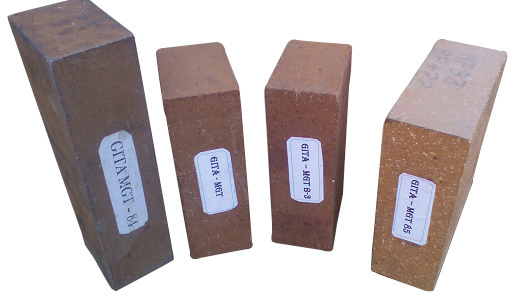 The refractoriness of Magnesite bricks is about 18000°C. This is dependent on the Melting point of the bond. The RUL ranges from 14500°C to 17200°C. Spalling Resistance is poor for some grades and good for others. One reason for the poor Spalling resistance is a high coefficient of thermal expansion. Magnisite has the Highest thermal expansion coefficient among all Refractories. Spalling resistance is also dependent on the porosity. To improve the spalling resistance of Magnesite Bricks, Zirconium is sometimes added. Our Experts has created this 6 Proven Methods to select the Right Refractory for your Requirement. Please check at our Blog – Selecting Right Refractory.